We offer high quality Vacuum Breaker Valve and Vacuum Breaker Valve with Air Release Valve, which are designed to meet the industry requirements. Used as safety devices for storing tanks, containers, gas or vapor during transportation. These are available with preset setting and adjustable spring loaded arrangement. The seat and disc are designed so as to offer quick opening at the attainment of pressure. 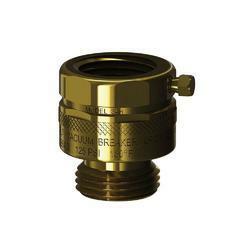 The Vacuum Breaker Valve is ruggedly constructed with bronze or stainless steel trim to give years of trouble free operation. The valve should be installed at high points along horizontal pipelines or over tanks. The combination of Vacuum Breaker with Air Release Valve eliminates air and prevents vacuum formations in waterworks piping systems. A large venting orifice and large float clearances freely exhaust or admit air during pipeline filling or draining. Looking for Vacuum Breaker Valve ?